Be sure to tell him or her what you want to discuss; no one wants to be told when they are having a conversation. Start by setting a timer for 20 minutes. If you want to go beyond the 20 minutes, each partner has to agree to it. If you feel yourself getting worked up, angry, or agitated, suggest that you table the discussion until a later time. The later time can be in a couple hours, the next day, or any other time that you are both agreeable to. Forcing a partner to talk about a difficult topic is the road to conflict escalation. However, if you need a break, it is crucial that you reschedule the conversation. This could mean agreeing to return to the discussion in an hour or calling your relationship counselor to schedule a couples therapy session. If you are speaking about a contentious issue, which by nature can lead to a heated discussion, recognize that your partner will have thoughts to share on the topic also. One strategy that works includes taking turns when speaking, with each of you having 3 minutes to share your thoughts. Upon the completion of one’s 3 minutes, your partner will paraphrase what you said before he or she responds. Too often, when discussing hot issues, we just want to make our point so we lob comments at our partner, start yelling, talk over them, sigh heavily, check our phone, etc. Use a convenient household good, such as a book, and hand this back and forth to signify when one partner has the floor. The idea here is, by slowing down the conversation, each of you can actually hear what the other one has to say and then respond thoughtfully and respectfully. I know what I am suggesting is tough to pull off – especially when we are riled up about something or feel mistreated, misunderstood, or over-ruled. If each partner can create an environment where both people feel heard, there is no reason to rush a conversation, to speak over one another, or resist a request to table or postpone a conversation. Marriage counseling can help you improve your communication and get your relationship on track, but using these techniques at home can be just as beneficial to your relationship. 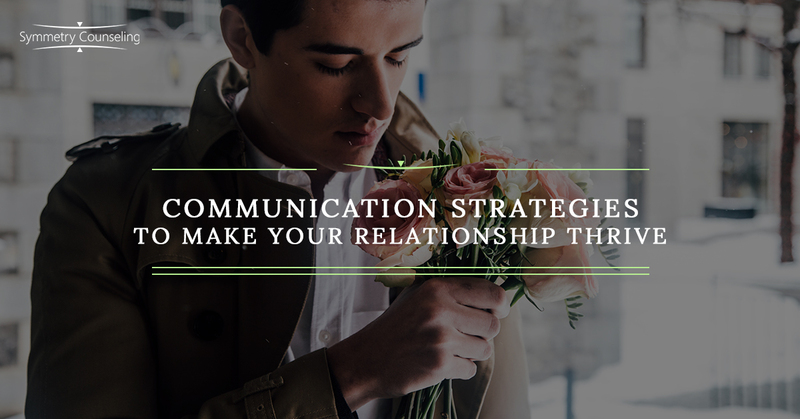 Invite your partner to a conversation and be specific about the topic. Be flexible about the time and place. Set a timer for an agreed upon amount of time for the discussion. If one of you needs a break – take it and reschedule the conversation. Agree to no name-calling and no talking over the other. Give each partner uninterrupted time to share thoughts about the topic, paraphrase, and then give the other the same opportunity. This may seem formal and awkward at first, but will definitely get easier over time. If you need help improving your relational communication skills in the Chicago area, please contact us at Symmetry Counseling by calling our office at (312) 578-9990.